Illustration Friday invites illustrators to submit work based on a weekly theme. I thought it might be fun to enter this piece and see what happens. "Well, the restaurant makeover worked out nicely, but I'd still avoid ordering the sashimi if I were you." Seriously though, John - very nice work. I hope you perused the link. Lots of artists had some terrific takes on the word "prehistoric". Lovely illustration.I love the 3D effect. Stone, on stone, on stone-very cool-I like the subtle ocean across the bottom too. Is this a variation on an earlier piece, too? Right again. 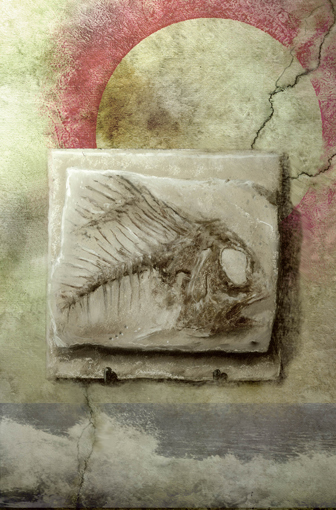 The fossil image was part of a much larger painting I featured MANY MONTHS AGO. I found this text very up-to-date and informative because it supplies excellent tips to receive the best possible Life insurance rates and quotes. With this handy info, you'll be able to make your choices extra wisely and procure one of the best Life insurance plan for yourself. Plus, there are normally a wide range of resources that can assist you better perceive your policy. What would all of us do devoid of the amazing thoughts you write about on this blog? Who else has the tolerance to deal with vital topics for the sake of common subscribers like me? My spouse and i and my guys are very blessed to have your site among the ones we regularly visit. We hope you know how a great deal we take pleasure in your hard work! Best wishes from us all. The points you discussed here are extremely precious. It turned out such a pleasurable surprise to get that awaiting me after i woke up this very day. They are generally to the point as well as simple to learn. Thank you very much for the thoughtful ideas you've got shared right here. Hiya, I just hopped over for your web site by way of StumbleUpon. Not one thing I would normally learn, however I preferred your thoughts none the less. Thanks for making something worth reading. Hi! Quick question that's totally off topic. Do you know how to make your site mobile friendly? My weblog looks weird when browsing from my iphone. I'm trying to find a theme or plugin that might be able to fix this issue. If you have any recommendations, please share. Many thanks! May I just say what a help to discover someone who essentially realizes what they are talking about on the web. You actually get experience to take a major issue to light and make it significant. Even more people require to learn this and understand this particular section of the story. I cannot believe you aren't more popular as you certainly have the gift. I must say you have a cool post. This hit the spot and then some! Thanks for posting this and sharing it with the world. I've just bookmarked your site. And I will check back soon to read your other articles. Keep up your awesome work. I don't ordinarily comment but I gotta tell thanks for the post on this great one : D.
Good post read. Its articles like this one that I'll bookmark it to promote on the web because its properly composed. Have you ever considered about adding a little bit more than just your articles? I mean, what you say is valuable and everything. Nevertheless imagine if you added some great graphics or videos to give your posts more, "pop"! Your content is excellent but with images and videos, this site could definitely be one of the greatest in its niche. Wonderful blog! Hi! This post couldn't be written any better! Reading this post reminds me of my previous room mate! He always kept talking about this. I will forward this post to him. Pretty sure he will have a good read. Thanks for sharing! Congratulations for posting such a useful blog. Your blog is not only informative and also very artistic too. There are typically very couple of individuals who can write not so easy articles that creatively. Keep up the great writing !! This page contains a single entry from the blog posted on December 8, 2010 11:18 PM. The previous post in this blog was Spiritual CD Cover Illustration Idea.